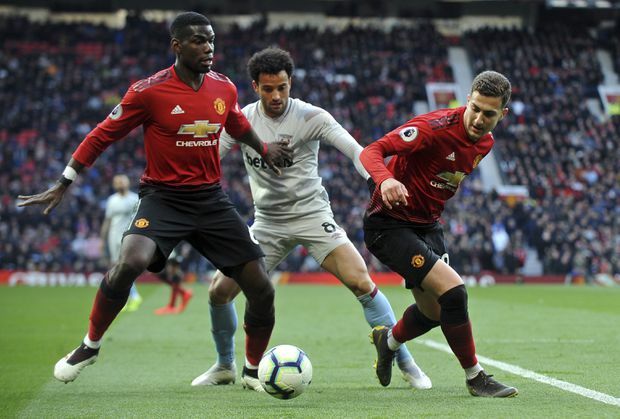 Paul Pogba’s calm nerves and David De Gea’s quick reflexes kept Manchester United in the hunt for a top-four finish in the Premier League on Saturday. It was a much-needed win for United, but it wasn’t a convincing performance as the hosts were outplayed for large spells and benefited from two disputed refereeing decisions. West Ham had a goal disallowed for offside in the first half before the hosts were awarded a soft penalty as Robert Snodgrass was judged to have fouled Juan Mata when the two collided in the area. The win ended a run of four losses in five games in all competitions for United and kept Solskjaer’s team two points behind fourth-placed Chelsea. For Brighton, though, the problems are mounting after losing in the FA Cup semifinals last weekend. Chris Hughton’s side has not scored in its last four matches, and another loss on Tuesday would leave the team just two points ahead of Cardiff. Moura made sure Tottenham didn’t miss injured striker Harry Kane as the Brazilian winger became the first player to score a hat trick in the club’s new stadium after Victor Wanyama opened the scoring in the 24th minute. Redmond put his team ahead in the second minute and then restored the hosts’ lead in the 30th, just two minutes after Willy Boly had equalized for Wolves. Shane Long added a third for the Saints, which moved eight points clear of Cardiff. Fulham finally managed to keep its first clean sheet of 2019 to give caretaker boss Scott Parker his first victory in charge. Captain Tom Cairney and Ryan Babel scored for the hosts to end Everton’s three-match unbeaten run.